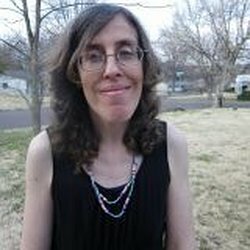 Todays interview is from a very talented writer – Debbie Manber Kupfer. So, I’ve read the first two books in your series, P.A.W.S. as well as a few of the short stories. They’re all great. Can you tell us about them? The first two books of the series, P.A.W.S. and Argentum are out and I’m currently working on books 3 and 4. (I’m not sure how many books there will be in the end). It’s a YA fantasy that focuses on an international organization of shapeshifters, The Partnership of Animagi, Werewolves and Shapeshifters (otherwise known as P.A.W.S.) I’m also releasing a series of short stories that tie in with the series, Tales from P.A.W.S. both as individual ebooks and as a combined paperback. When I’m not writing fiction I write puzzles for magazines and my website Paws 4 Puzzles and in early 2015 I published a book of logic problems, Paws 4 Logic together with my son, Joey. You have so many wonderful characters. I know who my favorite is, who’s yours? I have a particular fondness for Joey, the animagus kangaroo Australian exchange student as I based this character off of my son who shares a lot of his characteristics. My absolute favorite character however first appears in Argentum. He’s Gromer the Green – an old Welsh warlock with a fondness for pea soup (don’t forget the wizzlewoop). Gromer will be coming back in book 3 and I also plan sometime in the future to give him his own tale. Your main character, Miri, is a shapeshifter that can turn into a cat. Do I sense some major cat love? What made you choose this animal over all the other ones we see in paranormal fiction these days? Well first of all I need to point out that there are many different animals that are part of P.A.W.S. – everything from toads, to snakes, to flamingoes! But yes, cats do hold a special place in my heart and Miri is a cat because if I were a shapeshifter that’s the form I would take. Danny (also a cat animagus) explains it best – cats are known for being able to blend into the shadows and have a magic all of their own. So, Alistair – he’s the ultimate bad guy. For those who haven’t read your books, can you give a little background on him? What goes into creating a villain? Oh yes, Alistair. You may be surprised to know that Alistair wasn’t even in my original idea for P.A.W.S., rather Miri’s Uncle David was going to be the main antagonist, but a few chapters in Alistair emerged and basically made the story all about him. But there’s a lot more to Alistair then first meets the eye. I don’t believe that anyone is evil in a vacuum. There’s always a reason, and Alistair has his reasons. That’s why I wrote his origin story, Alistair, in Tales from P.A.W.S. Oh yes, Alistair was my favorite short story of yours. How do you walk that line between a villain that readers just hate, and one that’s a little more complex? A little more fun? Despite his evil, I think readers are drawn to Alistair – just like Nora and his pack are in his story. He’s attractive and has a charisma that shines out beyond his magic. I’m a huge Harry Potter fan, but the one part of the series I personally felt was weak was how Voldemort was drawn. There’s really no part of the series when we empathize with him and he’s mostly in the shadows while others, Snape, Malfoy, Umbridge take on the real role as villain. Not really for P.A.W.S. – I have a clear vision of the ending of the whole series and have even written the final epilogue – but I have only a vague notion of how we’re going to get there, but I’m looking forward to the journey. My biggest inspiration is probably JK Rowling, but I’m also a huge fan of Douglas Adams, Neil Gaiman, Cornelia Funke and Terry Pratchett. On a personal level after I wrote P.A.W.S. I took my prologue to a local writer’s group. Those writers who have since become my friends were probably my biggest inspiration. I also had the good fortune to meet Ben Reeder at a science fiction conference last fall. Ben, an indie author, who has been able to earn a living wage from his paranormal and zombie books is a huge inspiration. He proves that with good writing and a little luck it is possible to really succeed as an indie. I think there are very few of us that haven’t been influenced by JK Rowling. I know I was. What age were you when you started writing? I’ve been writing ever since I was a kid. I sent one of my stories about a day when I turned into a ladybug to the Puffin Post when I was around eight years old and got a mention in the magazine. Do you ever experience the dreaded writer’s block? A little – usually when I do I’ll go for a walk and take my writing out to a coffee shop or McDonald’s. I’ll write the old fashioned way then in a notebook and I’ll people watch. I love people watching – and yes a lot of those folk end up in my stories. I’m mostly a discovery writer. I have a vague outline in my head, but not usually on paper. What do you mean they aren’t real?! Here are a couple of fun questions! If you were a super hero, what would your super power be? I want “Mary Poppins” power. The ability to snap my fingers and have the house clean itself so I have more time to write! That’s an odd question. I grew up in London so (at least when I’m in the US) I have an East London accent. It’s not a posh accent – I don’t speak the “Queen’s English” and neither would I want to – but I find it strange how many Americans tell me they “like my accent”. The other thing that’s strange to me is when I go to England my friends there tell me that I now have a slight American twang to my accent. I, of course, can’t hear it all, but I believe they are right. I have a friend who also grew up in England but while I moved to America he moved to Australia. A few months ago he posted a video of an interview he did on Australian TV and I was dumbfounded; to my ear at least he had lost every trace of his English accent and sounded completely Aussie! When I first wrote P.A.W.S. I wrote it for myself. I had the story burning inside me and I knew it needed to come out. I only started thinking about publishing after I took my prologue to a local writer’s group. With trepidation I read it aloud and was amazed by the response. The writers in the group loved it and told me I needed to publish and one of those writers was Robin Tidwell of Rocking Horse Publishing. I knew nothing about the publishing process at the time and RHP gave me my chance for which I am truly grateful. They published P.A.W.S. and a year later the sequel, Argentum. In the meantime I met more writers both online and off and started learning about what indie publishing really entailed and in spring of 2015 ventured into self-publishing on Createspace when I published together with my son our puzzle book, Paws 4 Logic. I discovered that not only could I self-publish I also enjoyed the process and the freedom it gave me to set my own publication dates, choose my own covers and generally be in control. When my original contract expired with RHP for P.A.W.S. I thought long and hard and decided not to renew with RHP and in September 2015 I rereleased P.A.W.S. with a new cover and bonus bits. I’m grateful for the chance RHP gave me originally, but today I’m happy to be self-pubbed. I would have done some of the social media stuff in advance. Set up a blog, had a blog tour, online release party, stuff like that. When I was brand new at this I had no idea about the marketing side. I have a few upcoming projects. Firstly I’ll be releasing my three Tales from P.A.W.S. – Alistair, Ramora and Griddlebone – together in their own small paperback. I’m also working on a collection of my flash fiction stories, Tea and Dark Chocolate, that all being well will release sometime in the next few months. Then there are my picture books, Adana the Earth Dragon and Cecilia’s Tale. Both of these are out with illustrators at the moment and I’m very excited about the stories. Adana is the tale of a small brown dragon who discovers that she can do big things. Cecilia was my cat in Israel and this is the story of how she found and adopted me. Finally towards the end of the year I will republish Argentum and then the third part of the P.A.W.S. series, Umbrae. In Umbrae (which is currently out with my beta readers) Miri will travel to Israel and discover the secret of the purple book with Argentum on its cover that she first received in New York from the old crone. I try to take it in my stride. Not every book is for everyone and that’s OK. Try NaNoWriMo (National Novel Writing Month). It helps me a lot to set aside the month of November, (and April and July for Camp NaNo) to write. For just month at a time I can concentrate on my writing and let the other stuff slide. Also the social aspect of cheering each other on really helps me and I’ve made some good friends through my local NaNo group. How important do you think reading is to your writing? Essential. I truly don’t understand folks who don’t read. I read constantly and I think it helps me be a better writer. I must have a mug of tea with milk at all times! That I don’t make it to the end of my series. I’m a cancer survivor. I understand that we’re all mortal. P.A.W.S. is my little bit of immortality that I want to leave with the world and really hope that by the time I check out my story is complete. At eight years old I turned into a ladybird. The story prompt in the Puffin Post said to choose a creature and write a story from its point of view. I spent days wandering around my house and garden in Barking, a working-class borough of London, peering into my dad’s magnifying shaving mirror and imagining my life as a tiny red, spotted crawling thing. Then I wrote that story and sent it off to the magazine and I waited. Each time I wrote another tale, I escaped – escaped from the meanness that surrounded me in that playground, but back then I never put the bullies in my stories (that would come later when I wrote P.A.W.S.) My stories were my refuge and apart from that one tale I sent to the Puffin Post, I never shared them with anyone. Over the years I would continue writing. I wrote letters to an imaginary boyfriend in my teens. And as he was imaginary he wrote me beautiful letters back and sent me a handmade Valentine! During college I wrote bad poetry in a black bound notebook that I believe still sits in a box in my basement. Maybe someday the kids will clean out the basement and find the poetry and laugh at their mom. My own mother, I discovered a couple of years ago, used to keep a diary when she was a kid. I found it when I was helping her move and she let me keep it. It’s a treasure. She wrote mundane stuff about her everyday life, which is fascinating to me today, but also in the back of the book are two stories she wrote. So maybe this writing thing runs in the family. Both my kids write – my son recently started writing fan fiction for a game series he likes to play online. I felt very privileged when he let me read some of it a couple of nights ago (“but no editing, Mom, OK?”) Privileged and surprised. He has more confidence in his writing than I ever did at his age. Since I’ve been published my mum has read each of my books and enjoyed them even though fantasy isn’t really her thing. My father enjoyed the genre, but sadly passed from this world before I became a published author. Today I still find comfort and love in words. If I’m particularly tired or sad, I can sit down at my computer or just with a piece of paper and pen and write out an escape. Sometimes I’ll tear up the words, sometimes I’ll save them and eventually share them. But either way after writing it down I feel a little better. Hey Christopher, thanks for doing this. We’re all pretty excited to learn more about the man behind the brilliant world of deaths, so let’s get started. First, can you tell us a little about your books? School of Deaths and Sword of Deaths form the first two parts of a trilogy called The Scythe Wielder’s Secret. The final novel, Daughter of Deaths, will release in 2017. In School of Deaths, a young girl named Susan is pulled from her home in Maryland and brought to the College of Deaths, where she’s forced to train to become a Death, Reaping souls from the Mortal World to the Hereafter. She learns that she’s the first female Death in a million years, and faces sexism and bullying from all her peers. She eventually forms a group of close friends, and as the series progresses realizes that her presence in the World of Deaths is no accident. A war between the ancient original reapers, the Dragons, and the Deaths is about to erupt, and Susan’s right at the heart of the conflict. In Sword of Deaths, Susan and her friends find an ancient artifact that may help in the oncoming confrontation. In Daughter of Deaths, the Dragons attack, and Susan and her two closest friends undertake an epic journey across three worlds hoping to save the Deaths. You’ve written some great character that people can really identify with. Who’s your favorite? I really like Frank, and the arc his character goes through, progressing/maturing from the first book through the end of the series. I also intentionally paralleled Susan’s arc to Frank’s. As a woman, I loved Suzie. Girl Power! She’s the lone girl character of any importance. As much of a dream as that would sound to most girls, I’m sure it created some problems or unique situations when writing? Can you tell me about that? Yes! In the very earliest draft, the sexism wasn’t even an issue. The main character was Billy, and the College was co-ed. However, as I worked on the book, I wanted to increase the main character’s isolation, and that led me to realize that the overwhelming majority of grim reaper portrayals are either men, or are parodies. I wanted to make a female Death who wasn’t a parody, and was a strong heroine in her own right. However, as a man, writing in a girl’s point of view, particularly a teenager’s, can be problematic. In one scene in book one, Susan has her first period. It’s an intentional scene, both in terms of the fact that it sets her apart, and also it serves as foreshadowing for several events. I wrote the scene, then gave it my wife to help me re-write it, and later had two female beta readers pay special attention to it, but I’ve still had students tell them that scene in particular made them a bit uncomfortable. So, death, huh? Your characters are training to be grim reapers. Does spending so much time dwelling on death get exhausting? Death’s the only absolute certainty in life. While the book has extremely dark undertones, I intentionally kept the tone light, particularly in the first two books. The focus in my series isn’t really the reapings or the occupation, it’s the world that the reapers live in. From a social justice perspective, the Deaths in the book are not the horrors, the sexism and racism are. For me, and for the characters, the focus is on what we can do in our lives, not a fear of what might happen after. Personally, I love dragons. So, I was pretty psyched when I read your book and realized they were going to play a part. How do you find a new take on such a popular and often done creature? I love dragons too, and it was fun to write about them. Especially in Daughter of Deaths, when we see the world of the Dragons up close, I think you’ll find extremely different dragons than usually appear in fantasy or elsewhere. For me, the series has an underlying theme of addressing sexism, bullying, and racism. As one of the races, Dragons became a non-homogeneous collective. I think too many stories lump all dragons together as being one certain way. I think each dragon would have its own issues and own society. I always knew exactly how this series would end. However, without giving anything away about the end, all of the plot strings wrap up, but the door’s left open a crack. These days, there are so many amazing books out there. What authors have inspired you to write? My favorites growing up were Tolkien, Asimov, and Pratchett. They were my initial inspirations, joined later by authors such as Gaiman, Rowling, and Ken Follett. We were given an assignment to read three books, then pick an author of one of the three and copy their style. My three were: “The Lord of the Rings”, “The Mabinogion” (A Welsh myth cycle- I used the four book Evangeline Walton translation), and Robert Holdstock’s “The Hollowing.” This, while half the class chose “The Cat in the Hat” as one of their three. I ended up writing a short story in Tolkien’s style about the Ents searching for the Entwives. It was my first written story, and I’ve enjoyed writing ever since. I honestly don’t believe in writer’s block. I have trouble progressing at times (extremely rarely), but since I get so little time to write regularly, I have to be efficient about my writing time. I don’t have time for writer’s block. In the past, including for The Scythe Wielder’s Secret, I used what I called an image outline. I’d start with a concrete idea, and then develop a series of images. Many of the art pieces on my SITE are images from my image outline, that I later described to my cousin (the artist). I have vivid pictures in my mind, like photographs, and know I want them to be in the story, but don’t necessarily know how they’ll connect- I just write after that. However, the more I write, the more that’s starting to change. I’ve been working on my current novel by outline sections of about six chapters at a time, still connecting the image outline, but less by the seat of my pants. At the same time, I’ve already started a detailed outline of the book I’ll write after that, including eleven pages of pure plot outline, and a thirty page glossary of places/characters. This is new for me, and we’ll see how it impacts the writing. Our characters become like friends to us. Some of the time we spend more time with them than we do with the people in our lives. Do you ever get sad when you realize that the characters that you’ve created aren’t real? But they are real. As long as we can imagine them, they’re real in a sense. We all want the ability to do the extraordinary. Sometimes writing allows us to do just that. If you could have any power in real life, what would it be? Shape-shifting! It covers most of the other powers I’d want, including flight. I did not want to self publish. I queried hundreds of agents and publishers, before eventually finding the publisher who printed the book. It took me about a year to find a publisher, and then another year to go through the editing process. I’ve learned a lot about both writing and publishing since my first book came out, and definitely feel that I’ve grown as an author significantly. There is a sport called boskery that appears in the first two books. While I do think it adds to the novels, I’m not sure I would include it at all if I was to write them over again. Now, her friends journey deep into the heart of enemy territory, hoping to rescue her. Ancient secrets come to light. The horrifying truth behind Susan’s arrival in the World of Deaths is at last revealed. War erupts between Dragons and Deaths, and the fate of three worlds hangs in the balance. Daughter of Deaths, the epic conclusion to The Scythe Wielder’s Secret releases in 2017. The final novel in the trilogy is told from the same three points of view as book two. The series has now moved completely from light fantasy (Harry Potter/Percy Jackson style) to epic fantasy (Lord of the Rings/Eragon style). There’s a lot that happens in book three, and the end just may shock you. Criticism can be the hardest part of being an author. How do you deal with it? It hurts, but you move on, and focus on the positive acclaim you’ve gotten. In the end, I write because I have stories to tell. Not everyone will want to hear them, but the stories still need to be told. There has never been a better time to be a writer. The publishing world is wide open and more books are being published than ever before. Do you have any advice to give to writers thinking about jumping in to this crazy world? I like to write with Pandora on- I play film scores, or trailer music such as Audiomachine. And finally, for some fun – Dogs or Cats? Thanks for joining us, Christopher. Don’t forget to check out the exciting world of deaths in The Scythe Wielder’s Secret! The bookstore is built on a different model than large bookstores of the past, such as Barnes and Noble, Borders, or Books A Million. With most chain bookstores, books are stocked by the publisher’s demands. These demands are issued by the so-called “big five” traditional publishers such as HarperCollins and Houghton Mifflin. The publishers sign an author, and release a set number of books to the stores. A new author, for example, might get offered a 10,000 book run. All of the bookstores would be sent copies of the novel, totalling 10,000 copies, and the author hopes they sell. The bookstores are given a time limit, usually about three weeks, and then any books that are unsold are destroyed and sent back to the publisher. If the author had an advance, he can be docked the cost of returned books. If he didn’t have an advance, he still knows he likely won’t get another contract if the books sold poorly. With this model, the big five establish what books are in stores, and all books are either “make it or break it” novels for an author. If you don’t succeed big, you fail, and there’s little room in between. However, all of that might change. On Tuesday Feb 2nd, the announcement was released that Amazon will open HUNDREDS of physical bookstores. CNBC shared the announcement, citing up to 400 brick and mortar stores to open. Amazon retracted the statement shortly after, and while not denying that it plans to increase its number of physical stores, it is backing away from specific numbers. Only TWO days after the announcement originally aired, Barnes and Noble stocks had plummeted 14%, showing the real fear of the mega-retailer’s possible entry into the chain bookstore venue. If Amazon does open hundreds of physical bookstores, the entire publishing industry could change. Amazon has publicly stated that its physical bookstore’s selections are based entirely off of sales and ratings of books on Amazon.com. A quick look through the online store and many of the bestsellers are NOT published by the big five publishers. Many bestsellers are self-published books offered at Amazon only. If these then become the books seen in physical bookstore chains, how will the big five respond? In 2012, Houghton Mifflin filed for bankruptcy to help erase debt. The big publishers are facing increasing financial hardhips, and with the oncoming Amazon phyiscal chain, they NEED to shift their focus if they hope to survive. One model that may gain in popularity is Print on Demand, or POD. Many books, including The Scythe Wielder’s Secret, are currently offered as POD, and since books are only printed when they’re ordered, there are far fewer financial risks. If a national bookstore chain is filled with POD books, will old model publishers even be relevant? Could the big five focus on print on demand publishing, instead of enormous gamble-based runs? Could the older publishers focus on marketing, or other mechanisms not necessarily available to smaller presses, so that they still have something unique to offer? Or will the older publishers crumble, like Borders did? The only thing certain in the publishing industry is that the business is changing rapidly, and the old rules don’t necessarily work any more. In book three of the Xavier fantasy series, Xavier Jones and his best friend and guardian angel, Gabe are released from the dungeons of St Griswold College. They must find a way to reach Green Isle where Mortimer and his men are fighting those intent on conquering Clanarde—demons, gargoyles and the Darklaw. In the quest to fulfil his destiny, Xavier discovers the first secrets of the mysterious Celestial Ledger and witnesses a horrifying event in the grounds of St Griswold College. The Xavier series is set in the year 3016 and war is raging on Kepler, a planet settled by travellers from Earth 500 years earlier. Angels, demons and wraiths are battling in the night skies over the island of Clanarde. In a dystopian landscape left ravaged by the Great Atomic War 300 years ago, men, wizards and the original island’s inhabitants fight with gargoyles, shape shifters and the Darklaw using everything from physical combat to old magic. At the centre of the battle, young Xavier Jones fights his inner demons while trying to fulfil his destiny to save the children of St Griswold College. The final chapter in the Dark Winter series. What would you risk losing, in order to win? As the Crescent Moon set on that last day of winter, the residents of Gorswood realised that the horrors that had been contained in the woods for so long, had finally risen, and were coming for them. With the fate of Romilly, Beth, and Gorswood’s greatest ever witch uncertain, an age-old evil senses its time has come, threatening to cover the inhabitants of Gorswood in a new and never ending terror. Even if the newest owner of the Mirror of Souls is to prevail, at what cost will her victory be? Meanwhile, the last rites on a long dead demon need to be performed. But her spirit resides in the most terrifying place of all, meaning that a choice will have to be made. A choice that will affect the entire world…..
A short story from the world of P.A.W.S. Do you promise you’ll always be here for me?